Nancy Williams at Toledo workshop. Granville, OH (September 6, 2018) – A series of summer workshops provided Ohio science teachers from 37 Ohio counties with insight into real-world applications of STEM and geology lesson plans. The Teacher Academies, provided by the Ohio Oil and Gas Energy Education Program (OOGEEP), helped teachers connect Ohio science educational requirements to an energy industry that has a significant impact to the state and all Ohioans. 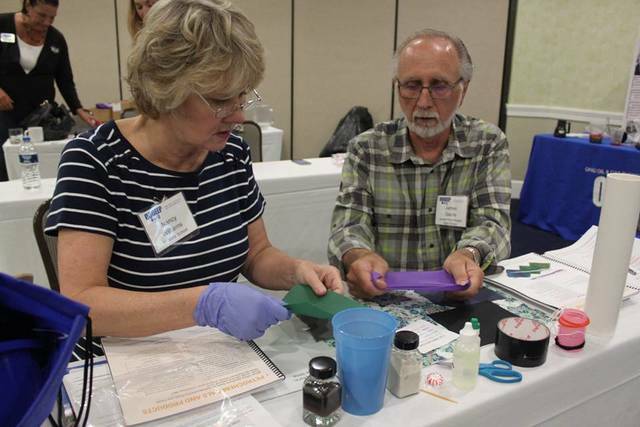 Nancy Williams, a science educator from St. Mary School, recently participated in a workshop held in Toledo. Other workshops were held in Marietta and New Philadelphia. OOGEEP’s curriculum, titled STEM Lessons in Oil and Gas Energy Education, included lesson plans and hands-on science labs. The curriculum demonstrates the importance of STEM in areas such as geology, physical science, environmental science, engineering and chemistry, among other areas, and why they play an important role in energy development. Educators attended either a STEM or geology focused workshop – helping to foster energy education by connecting science and geology to the energy industry. The workshops provided teachers with multiple hands-on learning stations, a forum to share best practices on how they educate their students, and an opportunity to participate in a variety of related field trips. Through the generosity of Ohio’s oil and gas producers, there was no cost for teachers to attend. In addition, all attendees received a wide variety of free resource materials, lab supplies, lesson plans, posters, maps, rock and mineral kits, science standards, benchmark connections, internet resources and activities that can be utilized directly in their classroom. The workshops also included guest speakers and field visits to Ohio sites such as the Oregon Clean Energy Center’s Natural Gas Fire Plant, Ken Miller Supply’s pipe yard, Kimble’s Geological Complex, as well as stops at several Antero Resources’ sites including a drilling rig, hydraulic fracturing site and horizontal production pad. OOGEEP provides educators additional support and programs throughout the year including classroom presentations to science classes of all ages through the Petro Pro program. OOGEEP also supports our students by sponsoring State Science Day awards in the spring and provides annual scholarships for students pursuing a career in the oil and gas industry. More information about all the resources provided, at no cost, to teachers and students can be found at http://www.oogeep.org/teacher-students/. OOGEEP works with more than 90 Ohio colleges, universities, and career and technical schools offering training for the 75 plus careers serving the natural gas and crude oil industry. To learn more about careers in Ohio’s oil and gas industry, visit http://www.oogeep.org/industry-workforce/careers/. Links to OOGEEP’s recently launched “Oil and Gas Careers in Ohio” video series can be viewed at www.youtube.com/user/OOGEEP1. This series of 28 modern career videos highlights more than 75 in-demand jobs within Ohio’s crude oil and natural gas industry. The Ohio Oil and Gas Energy Education Program (OOGEEP) is a non-profit statewide education and public outreach program. Created in 1998, OOGEEP provides a variety of programs throughout the State of Ohio. These programs primarily focus on teacher workshops, scholarships, science fair, firefighter training, industry training, career and workforce development, research and guest speaker programs. https://www.sunburynews.com/wp-content/uploads/sites/48/2018/09/web1_Nancy-Williams-Toledo-Workshop-2018.jpgNancy Williams at Toledo workshop.